Follow links to book pages for sample chapters, video trailers, and author stories! 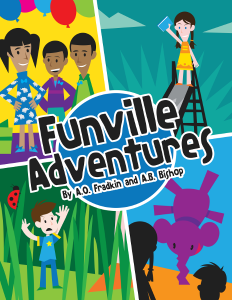 Funville is a math-inspired fantasy adventure for children ages 5 and up, where functions come to life as magical beings. After 9-year old Emmy and her 5-year old brother Leo go down an abandoned dilapidated slide, they are magically transported into Funville: a land inhabited by ordinary looking beings, each with a unique power to transform objects. 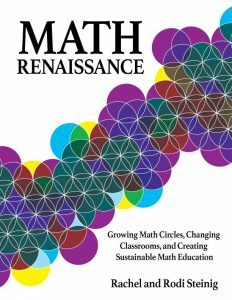 Math Renaissance is for teachers and parents of children ages six and up. The authors share their insights on how math experience might be improved at home, school, and math circle. 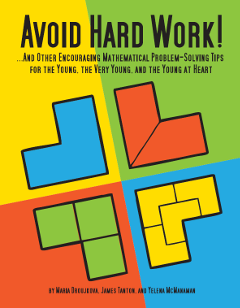 It is based upon Rodi Steinig’s experiences teaching math and leading math circles, and Rachel Steinig’s experiences as a school student and homeschooler. Avoid Hard Work gives a playful view on ten powerful problem-solving techniques. These techniques were first published by the Mathematical Association of America to help high school students with advanced math courses. We adapted the ten techniques and the sample problems for much younger children. The book is for parents, teachers, math circle leaders, and others who work with children ages three to ten. I will share with you what I have learned as I tinkered with teaching problem solving to curious young children, ages six to eight. The purpose of this book is to invite you to experiment with your own children or students, without any preconceived notions of how the outcome will look. Instead, allow your personal taste and the children’s feedback to guide you. By Malke Rosenfeld and Gordon Hamilton. Do you want your children to feel like algebra is beautiful, playful, and intuitive? Come play, solve, talk, and make math with us! 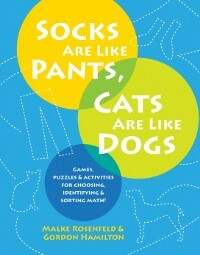 Our early algebra book Socks are Like Pants, Cats are Like Dogs is filled with a diverse collection of math games, puzzles, and activities exploring the mathematics of choosing, identifying and sorting. Teachers and parents have tested all activities in real classrooms and living rooms. The activities are easy to start and require little preparation. 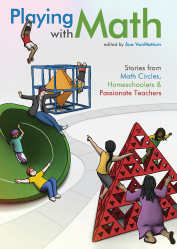 The book brings together the stories of over thirty authors who share their math enthusiasm with their communities, families, or students. After every chapter is a puzzle, game, or activity to get you and your kids playing with math too. Who’s this book for? Parents, grandparents, teachers, math enthusiasts, math-haters who don’t want to pass their affliction on, … Everyone! Thoughtful stories, puzzles, games, and activities will give you new insights. Join us – we’re playing with math! Mathematics is a creative activity, like music. It requires some technique, and the technique has to be taught, but the main point is elsewhere—it is all about creativity, a sense of enjoyment, and higher purpose. This book goes a long way in that direction. Sue VanHattum has assembled a marvelously useful and inspiring book. It is filled with stories by people who don’t just love math, they share that love with others through innovative math activities. Playing with Math is perfect for anyone eager to make math absorbing, entertaining, and fun. By Mark Saul and Sian Zelbo. Illustrations by Sian Zelbo. This book offers a deeper insight into what mathematics is, tapping every child’s intuitive ideas of logic and natural enjoyment of games. Simple-looking games and puzzles quickly lead to deeper insights, which will eventually connect with significant formal mathematical ideas as the child grows. 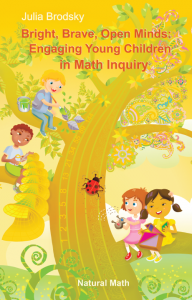 This book is addressed to leaders of math circles or enrichment programs, but its activities can fit into regular math classes, homeschooling venues, or situations in which students are learning mathematics on their own. The mathematics contained in the activities can be enjoyed on many levels. By Yelena McManaman and Maria Droujkova. Illustrations by Ever Salazar. Now you can create a rich math environment for your baby. Help your toddler discover deep math in everyday experiences. Play games that will develop your child’s sense of happy familiarity with mathematics. By Maria Droujkova and Dmitri Droujkov. Illustrations by Victoria Kolchenko. 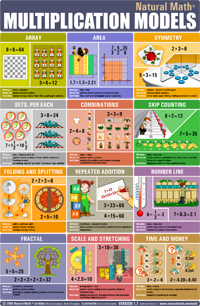 Natural Math multiplication poster was created by and for children, parents, teachers, and mathematicians. It uses clear, fun pictures to present twelve common multiplication models. Each model comes alive in two artistic examples with formulas, the types of numbers appropriate for the model, and a list of activities. This is a perfect compliment to my multiplication unit with 2nd and 3rd graders! Affordable, attractive. I just love it! Why am I not receiving your newsletters? Usually it’s because of overactive spam filters. Find an email with words “Natural Math” from reach.out@naturalmath.com – look in your social and spam folders if you don’t see it in the inbox. Let me know how it works! Glad you are interested. I am quite fond of our newsletters. I would like to buy the pdf versions pf playing with and camp logic. Unfortunately when I try it my cart is charged with shipping costs, why is it? I don’t want the books to be sent to Chile, I would like to have them now. I just tried to order PDFs while selecting Chile, and our shopping cart did not try anything wrong. Do you think you might have a paper book in your cart as well? If so, press the X (cross) sign next to it to remove it. If it keeps glitching, please let me know and I will send you PDFs by email. These are great books and I hope you enjoy them! My 11 yr old son used to love math. At an early age he figured out concept of numbers, recognized patterns, etc. This last year, I have noticed he is not so enthusiastic about math. I can tell he needs a deeper understanding. Often his teacher will teach a “rule” in math. My son can easily memorize this “rule” and implement it, but he often wants to know why he is doing the rule or why this rule works. Often the teacher cannot explain why; “it’s just the rule”. Also many lessons now are taught on the computer. Don’t get me wrong, my son loves to play on the computer, but he often says how he does not like lessons being taught on the computer. He would rather get on the white board and figure things out with his teacher. This unfortunately is not able to happen. I see his spark, his love and curiosity of mathematics drifting. Since he was young he always spoke of being a mathematician. He does not talk about that anymore. He will be finishing up 8th grade math this year. Do you have any resources for kids his age? Any advice for us in how to get him loving math again? Sorry about the delay – this has been misplaced in the moderation queue. It’s sad about your son, and I hope you find ways to fuel his fire again. As you said, it’s about people. Working with someone who cares, talking with someone who shares your passion. Have you tried to look for local math circles, where you live? They are usually ran by enthusiasts. If not math, maybe other math-rich experiences like robotics? Is there a way to find a creative math person to work with him on mathematics? We do have events for older children like this, sometimes. I hope to have more, so your son and others find online friends. Meanwhile, take a look at what’s happening online at The Art of Problem Solving – maybe their group classes would be interesting for him? Hi, I see your book “Bright, Brave, Open Minds: Engaging Young Children in Math Inquiry” on Amazon but not here. Is that the only way to buy it? There is no info on the book and also no e-book version – shipping is a bit of an issue as I’m in South Africa. But really want to read it! The Amazon thing is a fluke – not intended to happen, just the launch gone in a slightly asynchronous way. We should launch this book here this week, with all the usual electronic versions and name-your-price PDF. Stay tuned! 1. One copy of any of your book would all ages ( ages 9,7,5 3 and 18mths)? 2. do you have a coupon that I can apply to my purchase? 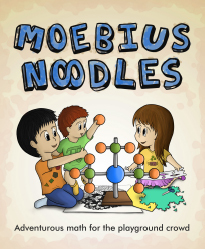 I would say Moebius Noodles and Playing with Math have materials for parents or teachers of children of all ages. 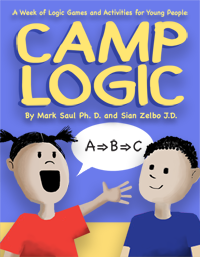 Camp Logic is for your older two, and Socks Are Like Pants for your middle three children. We will have a sale on paper books soon (the newsletter will announce it). Meanwhile, PDFs of all our books are available at prices you choose yourself. It’s a part of our open license promise to do so! What would your shipping to Australia be like? It’s probably about 15 dollars for a book. I suggest you buy several with friends (there’s also a nice discount if you do so). You can put things into the shopping cart and it will tell you shipping before you have to pay. Megan, amazon.ca has at least some of these books. You will get a better price here if you buy our bundle. Another option to save on shipping, if you want just one or two titles, is to buy with friends. We have large discounts on 5+ books of the same title. I hope one of these options works out for you. Currently Amazon.ca doesn’t have any of them. They “carry” them, but they don’t actually have them. I WANT to buy the bundle, but it goes from $50USD to $75, which is really like $115 after the exchange. That’s a lot of money! I would love to get the bulk discount, but I live on a tiny island in the middle of nowhere, so have no one to go in on them with. Have you guys thought about selling through Chapters here in Canada? Please tell me more about Chapters. I’ll see what I can do. Also, I will look into Canada shipping closer for prices. Chapters is just a big box book store here in Canada. I usually shop locally, but Chapters would reach all of Canada in one go, and it offers free shipping to us Canadians! Hi Megan – I am thinking of purchasing some of the books on your site. I wasn’t very sure which age groups each of the 5 books on your site are meant for. Can you help me understand the target age-group for each of the 5 books? Ok, I feel silly, but I just purchased the bundle of ebooks and can’t figure out how to put the kindle files into m library of kindle books on my kindle. I’ve already downloaded them to the kindle, via my email, but they sit it “Documents,” and I want them to live in the Kindle book library like other books. Can you give me a clue or point me to an FAQ or list of instructions? Here are PC instructions for Kindle. Not exactly obvious! Let me know if you are on a Mac – the instructions are slightly different. Please try them and let me know if a step does not work. We’ll then try to figure it out. 1. Connect your Kindle Touch to a computer with the USB cable. 2. Open Windows Explorer. Your Kindle Touch will appear in the same location as external USB drives usually appear, in the “Computer” or “My Computer” menu. 5. Eject Kindle from the computer. Your content will appear on the Home screen. I have a Mac and have also had problems downloading to my Kindle. Can you please send me th instructions for the Mac. With Mac or PC, you can attach your Kindle with a USB cable, and then drag and drop the .moby file onto your Kindle. Several online sources claim the email is easier. It works from any device to Kindle. Please try this and let me know how it works. I hope you enjoy your books! 1. Your Kindle has an email address for file downloads. To find it, go to http://www.amazon.com/myk using your browser. Tap on “Your Devices,” then choose the relevant Kindle from the gallery below. Next to “Email,” you’ll find the Kindle’s email address. 2. You need to tell Kindle your own email address (for safety). Click “Settings” and scroll all the way down to the “approved personal document e-mail list.” Click “add a new approved e-mail address,” and add the email address you intend to send your books from. 3. Make sure your Kindle is attached to a Wi-Fi or 3G network, so that it can receive emails. 4. Attach the .mobi file to an email, with any subject, and no body in the email. Send it to your Kindle’s email address. It should appear on your Kindle shortly. I have a 5 year old. Which book would you recommend? Thank you for your interest! We added a guide to the beginning of the page with recommendations on where to start, by ages. I hope it helps! What manipulatives/learning tools would be necessary to implement the teaching in the books. I am interested in buying the ebook bundle to use while we travel however worried that they will then tell me I need a lot of manipulative which I will not be able to carry around whilst we travel. Will I be able to do the books justice with very little learning instruments? We made a big effort not to require special manipulatives. People use these books all over the world, and situations vary. An activity here or there calls for yarn, scissors, or a mirror, but the vast majority of them can be done with only paper, markers, and found stuff like pebbles. Since I have Playing with Math, can I get the Bundle without Playing with Math and with Avoid Hard Work? Now we changed the shop so that you can mix and match books for your own bundle.